We have an art teacher who comes over one afternoon a week. He is a nice, young man who always has something interesting to teach the children. This week he brought supplies to make Ukrainian Easter eggs. The children had never before tried their hand at making those pretty eggs. I think they turned out beautifully! of the perpetually unmatched sock pile, pray for us. Our family was so sad to hear of the death of Tasha Tudor. Her books and drawings have brought us much joy over the years. May she rest in peace. Are you familiar with Mary Azarian's beautiful artwork? 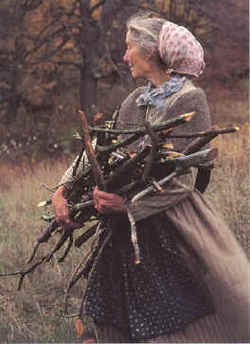 Mary is a Vermont woodcutter whose illustrations adorn over forty picture books. Her woodcut illustrations for Snowflake Bentley won the Caldecott Medal in 1999. Mary sells flower prints, greeting cards and alphabet prints as well as a number of other prints, both colored and black and white, on her website. Azarian's illustrations are comforting reminder of slower paced life. While that pace still exists in some areas of our country, things have sped up over the years for most of us. 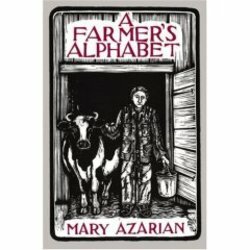 Mary Azarian has a knack for slowing us down and showing us all that is good in life: vegetable gardens, rocking chairs, zinnias growing in the flower beds, canning jars on the counter, smoke streaming from the chimney on a snowy winter's day. The little ones have also enjoyed Barn Cat, which is a counting book. For any of you who love to knit, crochet or enjoy fiber arts, A Symphony for the Sheep is a fun read. Set in Ireland, this book describes and gives a rhythm to each part of the sheep to shawl process. Mary's illustrations along with lively text by Cynthia Millen make you want to learn to card, knit, weave and spin. The kids and I made these pinch pots today. 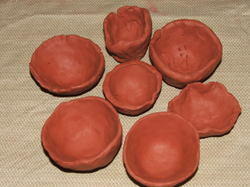 Clay is such a pleasant medium to work with, squeezing and squishing it can be very therapeutic! The pots are a lot of fun to make and can be done by just about anyone. The baby was the only one who couldn't really do it. 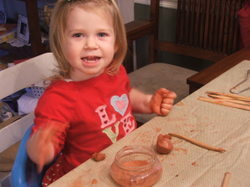 She played with the clay, the slip and the tools and was very happy. I'd highly recommend purchasing a vinyl flannel backed tablecloth if you are going to be doing a lot of crafts, especially clay or watercolors. I put mine on the table several times a day and I am really glad I bought it. I don't care what they get on it and don't have to worry about them scratching the table with tools or staining it with paints. 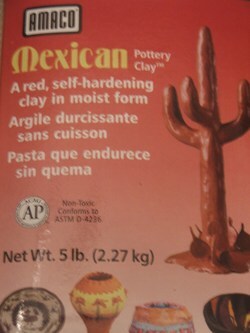 This summer, when buying school supplies for the upcoming year, I purchased a couple boxes of this clay from the craft store. As you can see, it comes in five pound boxes which will easily make a couple of projects, depending on your family size. It is self hardening clay that cannot be fired in a kiln. We used about a third to a half of a box today on the pinch pots. 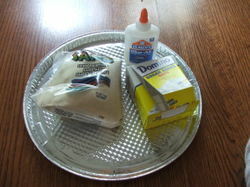 Here are the directions if you'd like to make them yourself. Take a bit of clay and knead it until it is soft and pliable. Form into a ball by rolling on the table under firm pressure (it should be about the size of an golf ball and should have no cracks). With thumb still in ball, use fingers to gently widen the hole by "pinching" the pot all the way around until the walls are the thickness you desire. Trim off top to make level, if desired. Decorate the outside with designs using a sharp tool, if desired. Paint or shellac if you'd like. The clay is not waterproof when hard/dried. I will post our artwork from both the Stockmar and Artistic Pursuits in a sidebar photo album for you to see. Today is a picture postcard day. There are huge downy flakes slowly falling from the sky, as though we were living in a snow globe or in Narnia. The ground is blanketed with almost a foot of pure white snow. Annie and Mary have been watching the squirrels from our back window. Annie squeals with delight when one of those little brown fellows comes close to our window. She claps our hands and laughs out loud. We all think it is especially funny when one of them emerges from the snow with a little cap or beard of white. "Just like Santa! ", yells Mary. We have had many feathered visitors at our feeders lately now that their normal food is difficult to find. Juncos, sparrows, nuthatches and cardinals have been regular friends. It is so pretty to see the cardinals with their beautiful red feathers against the snowy branches. Winter is a wonderful time to study birds because the landscape is stark and bare. They spend much time at the feeders, giving the us all a longer chance to sketch them. Each of the children recieved a copy of the Beginning Birdwatcher's Book for Christmas this year. It has forty eight realistic bird stickers to place in the book when the bird is seen by the child in the wild. Each bird page contains the following information: bird name in English and Latin, size, nest, eggs, food, range. 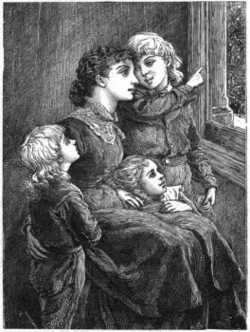 There is also a section on each page for the child's observations including: date seen, time of day, locality and remarks. I remember back to when I was a young woman in the corporate advertising world, just how much I dreaded northern Ohio winters. Maybe it was because I was out, dressed in a suit and heels, battling the elements. Maybe I was just immature or plain old unappreciative of the glorious changing seasons. I now enjoy the beauty and slower pace of winter days. There is something so comforting to me about a season of "hibernation" so to speak. I love the change of pace, the change of menu, the more peaceful activities surrounding our family. We spend much more time reading in the winter months, more time listening to good music, working on art projects, etc. On some of these quiet winter days, we have been listening to the Masters of Classical Music CDs. Included in this set are full length discs of the music of ten different composers: Mozart, Bach, Beethoven, Strauss, Wagner, Tchaikovsky, Vivaldi, Chopin, Schubert and Verdi. We have spent the past week revisiting Mozart and Bach, who are among my children's favorites. We studied Tchaikovsky and Vivaldi recently as well. Benjamin plays the Irish tin whistle and has been filling our home with many lively tunes while the snow falls. He is planning to attend a session of young Irish musicians next weekend. Christopher plays the recorder and picks it up several times a day to practice the songs he has been learning. We have also been spending more time on art this winter season than we have in the past. Last autumn, I purchased the fine arts program Artistic Pursuits based on a recommendation from the Mater Amabilis website. I cannot rave enough about what a wonderful art program this is for young people. My children absolutely love it. I am loving it right along with them. The lessons are simple yet leave much room for artistic interpretation. One of my favorite picture books is Tomie de Paola's The Art Lesson in which Tomie explains his frustration at having to do an art assignment "a certain way". This program gives guidelines for each assignment but does not dictate precisely what the children are to draw, paint or sculpt. It uses quality art materials; watercolors, pastels, clay, graphite drawing pencils, etc. 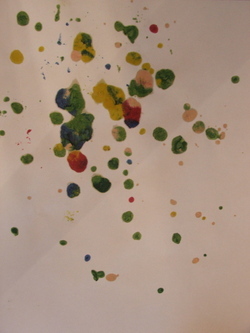 to teach children to express themselves artistically. Each book comes with a set of art masterpiece prints to be inserted, for conversation and example, into the book. There are several levels of instruction, and a couple of books for each level. Our whole family started out using the first book together. It is not too advanced for my six year old nor too slow paced for my ten year old or myself. My three year old has done most of the projects as well. I hope to post some photos of the work the children have been doing soon. So as far as I am concerned, it can snow up to the rooftop because we have plenty of beautiful things to do, to look at and to listen to. I hope you all are enjoying the winter months and spending special time with your family doing what you love. Please stop by Babylove and see all those delightful little piggies! Both of my sons enjoy working with hand tools. Benjamin began when he was four, hammering nails in a piece of soft pine. We supplied him with the real things although he was very young. He had a great respect for the tools and used them correctly from the start. At that time, we kept a small workbench in our basement that I had purchased from a Montessori school that had closed. It was just the right height for a young child to work efficiently and safely. I would like to tell you that the bench is neat and orderly but that is not the case. It is now kept in our garage (among many other tools, bikes and toys) but it still gets quite a bit of use. Benjamin now does his work at his father's workbench or outside because he has grown too tall to use the small workbench. Christopher, on the other hand, is able to use it comfortably. Last week the boys disappeared into the garage for quite some time. When they came back in the house, they told me that they planned to build a tiny tea table for their sister, Mary, out of some scrap wood they had found. 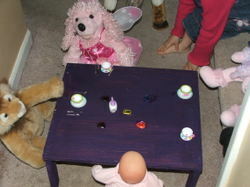 Mary just loves to play with her miniature tea set and sets up elaborate parties with her dolls and animals. I told the boys that the table was a great idea. They went back outside and set to work. After building the table, they sanded it smooth. 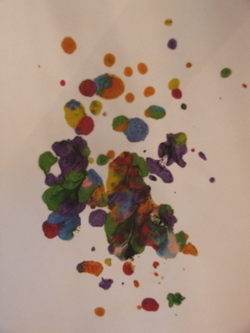 Then, they consulted their sister as to what color she would like to have it painted. She chose dark purple. Since we did not have any dark purple paint in the house, we took a trip to the craft store to pick some up. While we were there, they also chose some sparkly "jewels" that they used to decorate the top. While this table is not "professional" quality, it was made from the heart. It serves a wonderful purpose for its recipient, who will never forget the little tea table her brothers made for her. I also think the skills used and learned while making it are so valuable. But most of all, I shiver with happiness that these boys chose to spend their afternoon doing something to bring joy to another person. That, to me, is worth more than anything. The kids and I have spent the past five years learning American history. This year we took a break from it and are studying Ancient History. We have been using Susan Wise Bauer's The Story of the World, Ancient Times as a spine, along with its accompanying activity guide. While I think that SWB can be a bit of an overachiever, she certainly has some fun ideas packed into that activity book. There are reproducible maps to highlight the geographical area of study, supplemental reading lists, games to play, coloring pages and arts and crafts activities. 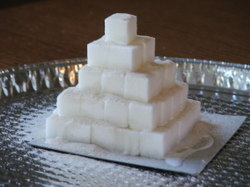 We decided to take her suggestion to build Egyptian pyramids out of sugar cubes. 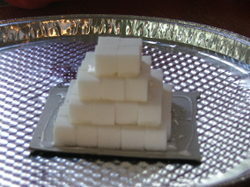 To build each pyramid, you need 55 sugar cubes, white glue and craft sand. In order to build a pyramid that can be displayed and handled, it must be glued together. 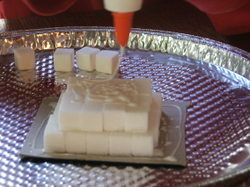 We began with a small piece of cardboard, which we covered with glue. 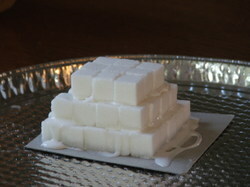 On it we placed the first layer of the pyramid which consisted of 25 sugar cubes. Follwing the first layer, a coating of white glue is necessary. The second layer of the pyramid is made of 16 blocks. 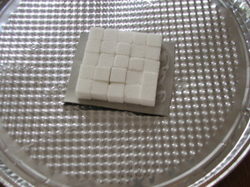 Each layer is coated with white glue and the correct number of blocks as follows: 25 for the base, 16 for the second level, 9 for the third, 4 for the fourth and lastly a single block on top. 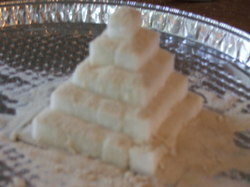 The excess glue is fine because after building the pyramid, it will be covered in sand. Next the layer of sand is added. When these are completely dried, I think we will use them in a diaorama of Egypt, just for fun. Interestingly enough, Cheop's Great Pyramid stands 481 feet high, contains 2.3 million blocks which weigh 2 1/2 tons each and was built completely by the hands of 100,000 slaves over the course of 20 years. Quite amazing. The kids and I had a lot of fun making this project. I have some books in the sidebar that we are working on for Ancient history. I welcome any other recommendations you might have to supplement our study. Thanks! 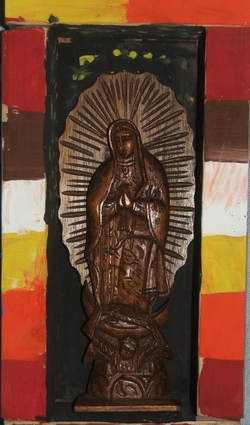 Ben (10) built and painted this box for our statue of Our Lady of Guadalupe. He gave it to me recently as a present. He chose colors that he thought looked "Mexican" and added some stars in the background of the box for decoration. I bought the statue last summer for one dollar at a yard sale. It is hand carved and very beautiful. I am delighted that Our Lady's statue now has such a special place to be displayed. My dear mother, knowing my love for Montessori education and philosophy, brought me this gift the other day. I have wanted one for years. I am just delighted to have it hanging in our learning room. Maria Montessori had a painting of Madonna of the Chair in each of her Children's Houses. Raphael's painting actually contains the person of St. John the Baptist, who in my rendition has been cut out. 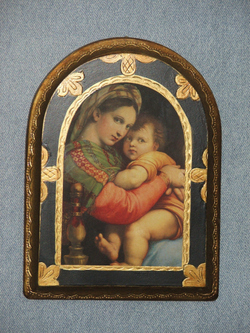 To view the entire painting as well as a history of Raphael, click here. I love how the people in Raphael's paintings are not thin and whispy but rather chubby and healthy looking. Baby Jesus' legs look a bit like my Annie's! Couldn't you just give them a squeeze?